The Grand Hyatt Mumbai recently hosted a Spectacular Event to Celebrate the Festival of Lights called the ‘Living Grand‘ and I was so privileged to be a part of this festive extravaganza, along with other prominent socialites, top travel and lifestyle influencers and media from India and abroad. In its quest to unlock the extraordinary in every moment, the Grand Hyatt brand introduced Living Grand for the Holidays; a global programme highlighting seasonal traditions around the world and the many ways in which Grand Hyatt hotels celebrate them. The programme kicked off in December 2014 with a global event spanning three continents and celebrations in Melbourne, Berlin and New York, inspired by the local seasonal celebrations. A series of Chinese New Year festivities followed in February 2015, featuring customised events in Singapore, San Francisco, Taipei, Shanghai and Guangzhou. In continuation of the Living Grand for the Holidays programme, Grand Hyatt Mumbai held an extraordinary Diwali celebration featuring signature cuisine, festive traditions and unexpected moments for their guests. The ‘Living Grand’ was almost a surreal experience for me where I got the chance to experience the signature Grand Hyatt world-class hospitality,unparalleled grandeur infused into every minute decor element & every moment,the extravagant & lavish dinner feast and scintillating performances by the skilled dance troupe. I got a chance to meet a very interesting mix of achievers at the event from all around the globe including filmmakers, international bloggers & journalists and indulge some engaging conversations over totally scrumptious food and cocktails. All the guests were dressed in their festive finery and were seen thoroughly enjoying the whole experience and festive ambiance. 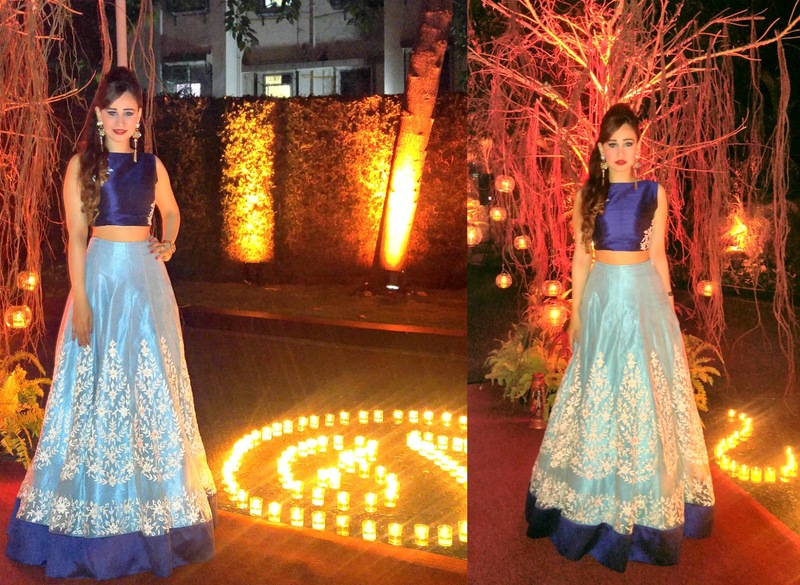 I wore this gorgeous blue lengha from Pink Peacock Couture, keeping in mind the festive feel of the event. On 5th November, Grand Hyatt Mumbai highlighted its bold event ideations with a magical play of light. An exclusively curated menu presented reimagined flavours of India, using some of the finest locally sourced ingredients such as Andaman rock lobster, Kashmiri morels and Kerala vanilla beans. Guests experienced a series of extraordinary moments – a dramatic performance of Indian dance forms and a spectacular pyrotechnics display ended the evening in grand style. The Event Partners for the Grand Hyatt Mumbai Living Grand for the Holidays were Hyatt hotels’ longstanding philanthropy partner in India, Smile Foundation, was the CSR Partner for the event while Good Earth was the Lifestyle Partner. It was such an awesome experience being a part of the Living Grand event with Grand Hyatt and I took away some real memorable memories from the spectacular event. The Living Grand is truly a sensory experience created to delight, entice and most importantly impress. You can follow all the exciting updates from Grand Hyatt on their website, Instagram, Facebook and Twitter. What an incredible night! That outfit is beyond stunning. I love it! I want to… me too.